Viewing 24 of 187 items. Set of 100 paper Caspari napkins. You select personalization style, imprint color, lettering style and positioning for your personalization. 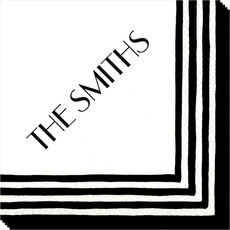 Font size is determined by the typesetter depending on..
Set of 100 paper Caspari guest towels featuring our Zanzibar pattern. You select imprint color, lettering style and positioning for your personalization. Font size is determined by the typesetter..
Set of 100 paper Caspari napkins. 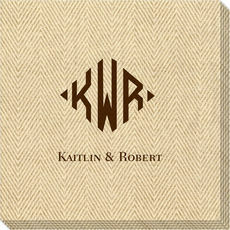 You select napkin size, imprint color and lettering style for your personalization. Positioning only as shown. Quality 3-ply napkins you'll be proud to use or..
Set of 100 paper Caspari guest towels. You select imprint color, personalization style and positioning for your personalization. Quality 3-ply guest towels you'll be proud to use or give! 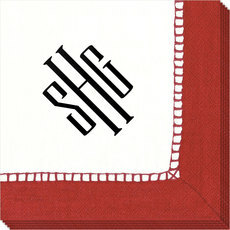 Size is..
Set of 100 festive Caspari napkins as shown with your personalization. Available in beverage/cocktail size or luncheon size. You select imprint color, lettering style and positioning. 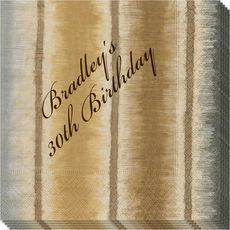 Font size is..
Set of 100 paper Caspari napkins with the textile look of a linen border. Available in beverage/cocktail size or luncheon size. You select imprint color, lettering style and positioning for your..
Set of 100 paper Caspari guest towels with the textile look of a linen border. You select imprint color, lettering style and positioning for your personalization. Font size is determined by the..
Set of 100 paper linen Caspari guest towels. These air-laid paper guest towels have the look of linen with a thicker, plusher, more luxe feel. You select imprint color and lettering style. 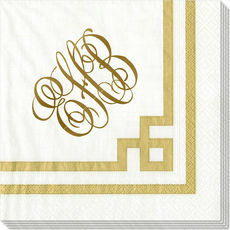 Positioning..
Set of 100 paper Gold and White Greek Key Caspari napkins. Available in beverage/cocktail or luncheon size. You select imprint color and lettering style for your personalization. Positioning only as..
Set of 100 paper Caspari napkins. Available in beverage/cocktail or luncheon size. You select imprint color, personalization style and placement for your personalization. Font size is determined by..
Set of 100 paper Caspari napkins. Available in beverage/cocktail size, luncheon or dinner size. You select imprint color and positioning for your personalization. 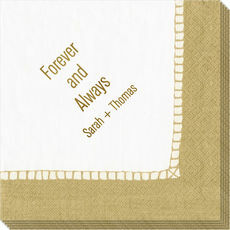 Cross design will always appear above..
Set of 100 paper Caspari guest towels. You select imprint color, lettering style and positioning for your personalization. Cross design will always appear above personalization as shown. Font size is..
Set of 100 paper Caspari guest towels. You select imprint color, lettering style and positioning for your personalization. Size is approximately 4.3" X 7.75". Beautifully packaged and ready for gift..
Set of 100 paper cocktail/beverage Caspari napkins. You select imprint color, lettering style and positioning for your personalization. Font size is determined by the typesetter depending on length of..
Set of 100 paper Caspari napkins. 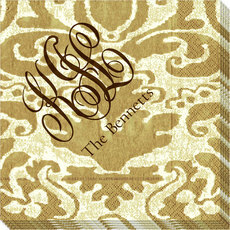 Luxurious napkin material sourced from Europe and personalized in the USA. Available in beverage/cocktail size or luncheon size. 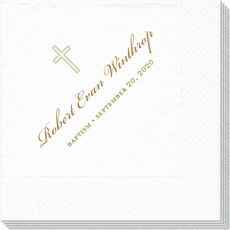 You select imprint color, lettering..
Set of 100 paper Caspari guest towels. You select imprint color, lettering style and positioning for your personalization. Quality 3-ply guest towels you'll be proud to use or give. Size is.. 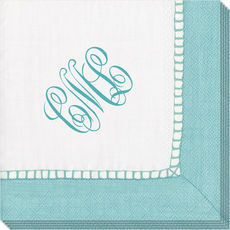 Dress up your next party with beautiful personalized Caspari napkins and guest towels. Caspari is respected for their exquisitely designed and printed paper products, with a reputation earned over the past sixty years by reproducing the work of established artists and museums from around the world. While the company has grown considerably since 1945, it continues to work with the same European printers and suppliers who originally collaborated with H. George Caspari. The Stationery Studio has teamed up with Caspari to offer its wonderful personalized products. Many of these items are inspired by such museum collections as the Musée de l'Impression sur Etoffes, The National Gallery, Williamsburg and The Royal Horticultural Society, as well as outstanding private collections and archives. 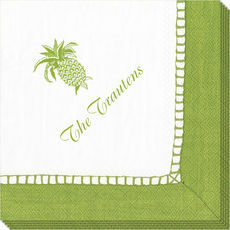 Let us help bring color to your event with an extensive collection of personalized napkins. Caspari has managed to dress up the plain white paper plate with sophisticated patterns. The company, committed to fine art, presents a wide selection of designs ranging from the classics to the work of contemporary artists from around the world. Be it a formal affair, a birthday party, or a cocktail party, Caspari napkins and guest towels will set the perfect tone for your home or party. Sophisticated designs will also dress up your upcoming events with color, style and sophistication. Many of Caspari designs are inspired by renowned museum collections as well as by outstanding private collections and archives. Their classic styles are created to achieve a sense of integrity and flair and printed with the best techniques on quality materials. 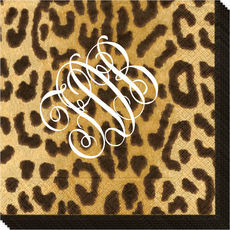 Our collection of personalized Caspari napkins and accessories will make a perfect statement. Visit our entire Caspari boutique for selections including holiday cards, napkins, guest towels, invitations and place cards.